The Journal aims to publish quality material that contributes to accumulate dynamic knowledge which is able to revitalize and foster the research and development carried out in different disciplines. 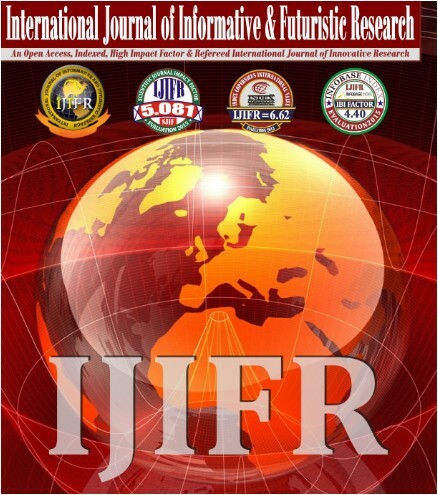 IJIFR brings into the world the understanding of various faculties in one platform to have access to accurate information and new innovations & provide a rapid turn-around time possible for reviewing and publishing, and to disseminate the articles freely for teaching and reference purposes. Its multidisciplinary approach is deliberate to bring the worldwide eminent intellectuals on one platform to illumine the world of knowledge. IJIFR publishes original materials concerned with the theoretical underpinnings, efficacious application, and potential for evolving technology integration in a global range at all edification levels. It aims to guide the society to formulate and reinvent engineering education and to be the cutting-edge of latest trends. Papers submitted for publication are selected & peer reviewed through full double - blind international refereeing process to ensure inventiveness, uniqueness, originality, relevance, and readability.